For years now, Samsung and Apple have been rivals in the smartphone arena. Their rivalry even went to the courts, at one point, over possible patent infringement (1). The Galaxy S7 and the iPhone 7 are both smartphones—they both have cameras, they can make calls, browse the web, etc.—but besides the basics, these giants of the smartphone arena have plenty of differences. Let’s have a detailed look at what areas set these legends apart. While both of these models are beautiful, the Samsung S7 may win the beauty contest. The S7 comes in an IP68-rated, 142x70x8mm chassis and weighs 152g. The iPhone 7 comes in an IP67-rated, 128.3×67.1×7.1mm chassis and weighs only 138g. The difference in IP rating is slight, with the Samsung being able to survive a 1.5m submersion for 30 minutes, while the iPhone can only do 1m for thirty minutes (2). Either way, when your phone falls in your drink it will have a better chance of surviving the experience. Both of them are dust-proof. The S7 comes in 5 colors: black, white, gold, silver, and pink gold. The iPhone 7, for the first time ever, also comes in an assortment of colors. You can get it in gold, silver, rose gold, black, and jet black, with Jet Black being the only glossy color offered. The iPhone lags behind the S7 in the looks department, probably because Apple has used the same essential design for three models in a row. The S7, with minimal bevels and featuring a glass front and back, really tugs the eyes. The edges are cased in metal, and overall it is probably the most beautiful smartphone on the market. The Retina HD display on the iPhone 7, at 25% brighter than that of the iPhone 6(3), is certainly an improvement. The new display measures 4.7 inches (the same as the iPhone 6) and has a resolution of 326 ppi. The display also features 3D touch, meaning it responds to the pressure of your finger. The lengthy press-and-holds are replaced by simply pressing a little harder. The S7, on the other hand, has a 5.1 inch display at a higher resolution of 1440×2560. At 577 ppi the Samsung blows the iPhone away. The Corning’s Gorilla Glass 4 on the Samsung promises a tougher phone, but more than a few cracked screens have been reported (4), so be wise and get a case for your S7. The Samsung also features an always-on display. A small part of the screen stays on and shows the date, time, and notifications, so you don’t have to wake your phone to keep updated. The difference here is clear: the Samsung outperforms the iPhone when it comes to resolution and ppi. The smaller screen on the iPhone makes the difference less noticeable, however. The Samsung, depending on where you are, can have one of two processors. The first, in the United States and certain other regions, is the Qualcomm Snapdragon 820. This is an ultra-powerful 4-core processor capable of reaching speeds of up to 2.2 GHz that comes with an Adreno 530 GPU. If you’re in the UK and other selected regions, you’ll get the Exynos 8890 8-core processor, capable of speeds of up to 2.3 GHz, and the Mali-T880 MP12 GPU. Both available processors are top of the range and possess extreme processing speed. The S7 also comes with 4GB of ram and a micro SD slot supporting cards of up to 256GB. The iPhone features the new A10 fusion, a powerful 4-core processor capable of 2.34 GHz. Two of the cores are used for low-end apps, like e-mail. The others kick in as required. In theory, this should extend battery life. The iPhone does manage to slightly outperform the Samsung when it comes to speed. There are no apps on iOS or Android that can fully utilize the speed of these monsters just yet. The difference in performance will go mostly unnoticed. That is, until apps come along that can push these phones to their limits. Battery life is a big deal to smartphone users these days. It is great when your smartphone can outlast your workday and stay alive until night time, when it is most convenient to charge. The Samsung features a 3000 mAh battery, while the iPhone features a 1960 mAh battery. This is a big difference and according to techradar.com(5), the Samsung will last a good day and a half, while the iPhone can’t seem to manage a full day. If battery life is a concern, the Samsung is the obvious choice. The Samsung takes about an hour and fifteen minutes to complete a full charge. The iPhone takes an hour and half despite the smaller battery size (6). Both of these batteries are non-removable, which is a disturbing trend in today’s smartphone market. On the other hand, if the batteries were removable, those IP ratings probably wouldn’t hold up. 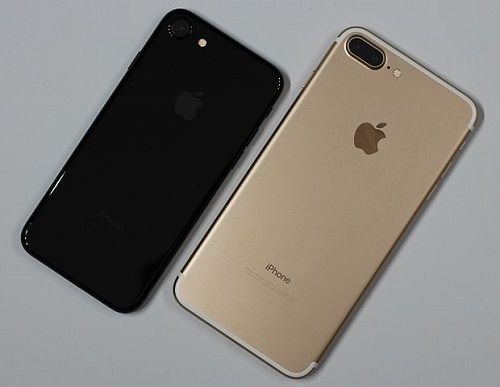 The iPhone 7 features the brand new iOS 10 as its operating system, while the Samsung was launched with Android 6.0.1 marshmallow. Nougat 7.0 has now arrived, and it is available on the S7. Apple’s iOS 10 enables the innovative 3D touch feature on the iPhone. Maps has been redesigned, there’s an overhauled lock screen, and many other new features. Android’s 7.0 Nougat promises dual app capability, allowing you to run two apps on a split screen. You could watch a video while texting, for example. You can use two or more languages at the same time and there’s 72 new emojis, among other features. According to knowyourmobile.com(7), the operating systems are very similar. There are major differences, such as Apple’s iOS featuring Siri and Samsung featuring the dual app capability listed above, but all in all the real difference here is user taste. If there were a meme competition, it would be a very tight race between exploding S7 notes and jack-less iPhone 7’s. That’s not what we’re here for, however. The iPhone 7 features dual stereo speakers, which are very impressive by themselves. Even though you’re being forced to use Apple’s own wireless earphones, at least without them there’s still good sound. The wireless headphones are a plus too. If you think about different tasks during which the cables get in the way often, wireless earphones sound amazing. For example, when you’re mowing the lawn, headphone cables often get caught on the throttle and rip your earphones painfully from your ear, but Apple’s wireless headphones solve this problem. The S7 features an unimpressive single speaker. The Samsung does have a headphone jack, however, so if you prefer headphones over earphones the Samsung would probably be your best bet in this department. Having a solid camera has become a necessity in today’s smartphone market. But camera’s differ, and while these competitors’ cameras look similar on paper, there are, again, clear differences. Both Samsung and Apple phones have always featured good cameras. The new models don’t disappoint. Some would say the camera on the S7 is better, however. Both feature a 12MP camera, and the Samsung has an f/1.7 aperture, while the iPhone has a slightly narrower f/1.8 aperture. Thus the Samsung’s depth of field is slightly better (8). Both can capture video at 4k, and, while the Samsung has a 5mp front camera and the iPhone a 7mp front camera, the difference is hardly noticeable. The major difference here is the aperture, which makes the Samsung a more viable choice for the hopeful photographer. On to the big one—perhaps the biggest one for many consumers—How accessible, exactly, are these devices? Well, a quick search on the internet tells us that the Samsung can be found on Amazon for an average of about $500. The iPhone can be found for an average of about $600. This is considering both new and used models. Brand new, the iPhone is also more expensive than the Samsung. It’s hard to say, exactly, what the cause of this difference in price is. The Samsung seems to be the better overall performer in comparison, but the iPhone has plenty of redeeming qualities. Design Design is new and beautiful. Larger than competitor. Design hasn’t changed. Comes in 5 colors now. Display Display is larger and offers a higher ppi. Smaller display leads to higher clarity, despite lower ppi. Performance Top end processor and higher ram. Higher speed despite fewer cores and ram. Battery Big, lasts a long time. Too small, not up to par with today’s market. Software 7.0 Nougat with dual-app capabilities. iOS 10 with the super handy 3D touch. Audio Single speaker, headphone jack. No wireless earphones. Stereo speakers, no headphone jack. Wireless earphones. Camera 12MP, better at catching detail and depth. 12MP, better in certain low-light conditions. Price +- $500. +- $600. Kyle Ferreira. "8 Key Differences between the iPhone 7 and the Samsung Galaxy S7." DifferenceBetween.net. January 9, 2018 < http://www.differencebetween.net/object/gadgets-object/8-key-differences-between-the-iphone-7-and-the-samsung-galaxy-s7/ >.